Unlimited orders and SKUs in all plans. No per order pricing. No hidden cost. What if I exceed my plan limit? For each plan, we have set a limit on the no. 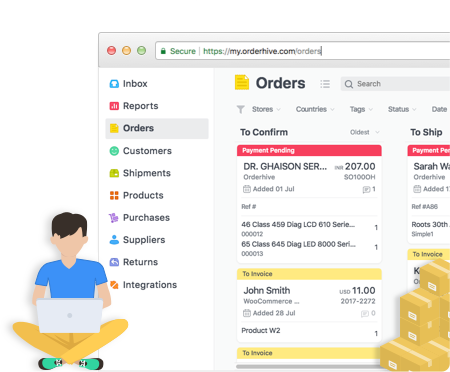 of integrations, warehouses, and users that you can do or create with Orderhive. You will have to upgrade your plan in order to integrate more than the supported store, create more warehouse and users in your current plan. Can I sign up for Orderhive Enterprise? Absolutely, while we’d hate to see you go, you can cancel the subscription at anytime. Can I extend my 15-day free trial period? 100%. All your data is completely secure and we protect your account with 256-bit SSL Encryption. Our technical team constantly run security vulnerability scans and tests to make sure everything is safe and secure. What time is your support open? Orderhive offers support 24 hours a day for 6 days a week via online chat and email. For any queries, feel free to get in touch with us anytime. We’d love to hear from you! Does Orderhive offer a knowledge base? To help you get started with Orderhive we provide an extensive knowledge base that consists of useful help articles and video tutorials. Check it out here. What is considered in no.of integrations? The sales integrations like Shopify, Amazon, eBay, Etsy etc & Accounting integrations like Xero, Quickbooks etc are considered in no of integration. Shipping integrations like FedEx, Royal Mail are not considered in integration. AmazonFBA is not considered too if integrated along with Amazon merchant account. Do you have plan for more than 6 integration? Yes, we do provide more than 6 integrations. We charge $50 for each integration above Growth plan. We provide unlimited integration in Orderhive Enterprise.